Gareth is doing a lot of talking to Bob. The rantings and ravings of a mad man I suppose. 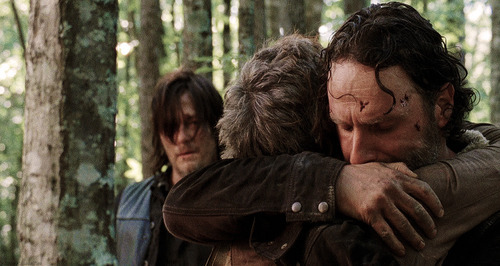 He tells Bob that he saw Daryl and Carol drive away. He threaten to go after Sasha next, saying that girls taste better than guys. Sasha confronts Gabriel, now that Bob, Daryl and Carol are missing. Gabriel swears that he doesn’t have anything to do with this. Sasha wants to know who is out there, and where their people are. 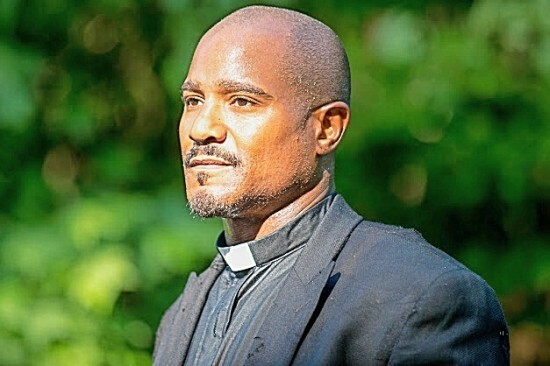 Rick accuses Gabriel of working with someone else. He asks him about the note carved into the church siding (You’ll burn for this). Gabriel’s story is that he always locked the church doors at night. When everything went down, and his congregation came for refuge, the doors were still locked. This week’s episode, while it did have a few important plot developments, seemed to be a whole lot of nothing. I could probably recap the whole episode in 3 sentences, but what’s the fun in that? While walking, and walking … and walking, the group hears a man crying for help. Carl whines at Rick that they need to go help. They find a clergyman of some sort trapped on top of a rock being harassed by walkers. They kill the walkers, saving the man. His name is Gabriel, and he hasn’t killed anyone, human or walker. He has a church, which is where he has survived since it all began, mostly on canned food from a food drive that happened just before it all went down. Rick doesn’t trust Gabriel, and I don’t either. Something’s afoot. Abraham finds a bus they can fix to continue their journey to Washington. For now, everyone else goes into the church. Gabriel tells Rick about one place he hasn’t scavenged yet, due to a dozen or so walkers. 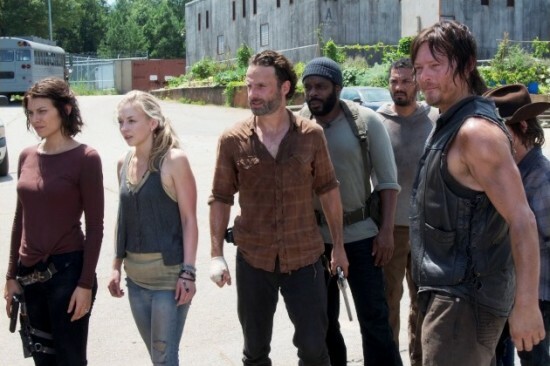 Rick takes Gabriel, Michonne, Bob, and Sasha with him. 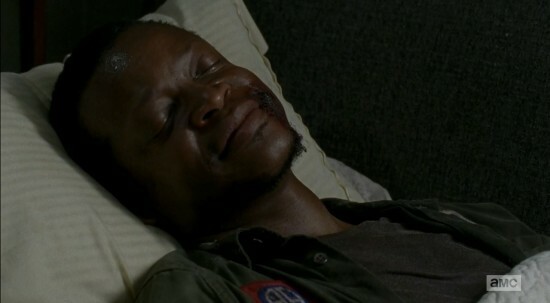 Before he goes, he warns Carl he is never safe no matter what, and to never let his guard down. Rick and the others are fashioning weapons out of their clothes and small personal belongings. They plan to ambush whoever comes in to get them. But the Terminans (not my term, that’s what the episode description called them) outsmart them by dropping a flash grenade from the top of the container. Rick awakens in a giant room alongside Bob, Daryl, Glenn, and four unknown men. It quickly becomes clear that the Terminans are cannibals, and Rick and the others are about to become dinner. The four “nobodies” are quickly disposed of via a baseball bat to the back of the head and a quick throat slit. 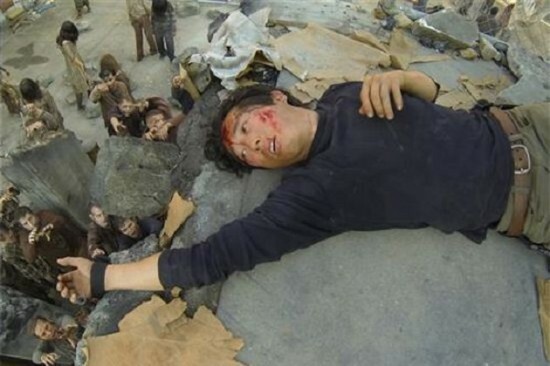 Glenn is almost killed twice, but a surprise attack on Terminus halts the plans. The leader goes outside to see what is going on, and leaves the muscle men with Rick and the others. Those that have not been taken to the meat market are still working on weapons and getting antsy. Maggie and Carl assure everyone that Rick and the others will be back, and they need to be ready. Sasha wants to know what cure Eugene has. Eugene explains that he used to work for the Human Genome Project, and he may have a way to turn deadly viruses into a cure. Meanwhile, Carol and Tyreese (and Judith) are still on the hunt for Terminus. Carol tells Tyreese that once they find Terminus, she won’t be staying. In trying to avoid a pack of zombies, Carol and Tyreese stumble across a man working the perimeter of the settlement. They tie him up, and Carol goes to check out Terminus. This was a fairly boring episode for about the first 25 minutes or so. But it picked up so much in the second half. This turned out to be a pretty great episode after some not so great ones. Rick returns without Carol, and tells Maggie what happened. She agrees with his choice, and Rick tells her he will only tell Herschel for now. Maggie has already gone to see Herschel to try and help, but he won’t let her into quarantine. When a patient dies from the illness, Herschel is bringing them to an isolated area to kill them when they turn. He doesn’t want the people seeing. He believes that a sad soul is worse than any germ. 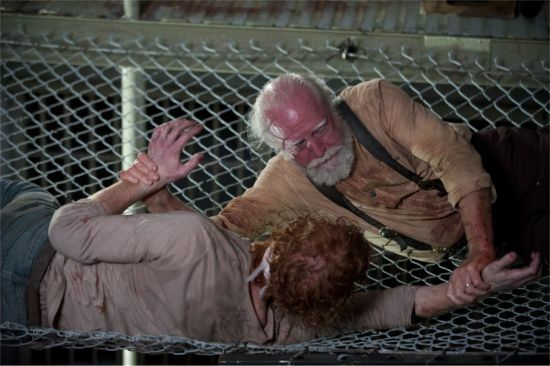 While Rick is talking to Herschel, a woman dies. Herschel passes by her to help Sasha, who has passed out but still seems to be alive. Herschel gives her an IV and she wakes up. She still thinks Herschel is a fool for risking his life to help them, but she is alive because of that.